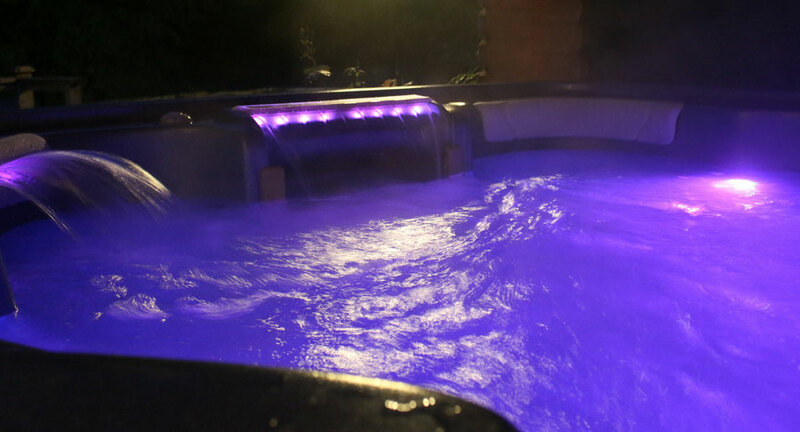 Take a short break in a Lake District holiday cottage with Hot Tub Jacuzzi. Ellen Hall and Cottages Made For Two is the perfect place to relax… there’s nothing better than spending some quality time in a hot tub after a day in the spectacular landscape of the Lake District. Cottages Made For Two doesn’t just offer a Lake District holiday cottage with hot tub, even better than that, it’s a Hydro-therapy spa/jacuzzi, which is an effective treatment for aches and pains. So Imagine after you’ve enjoyed a walk up Cat Bells, Haystacks or around Buttermere lake, coming back for soak and receiving some relaxing heat and muscle hydro-therapy. It’s great for back conditions too! Rain or shine, you can enjoy the spa sensation thanks to the log cabin that houses it and yet still feel at one with the beautiful surroundings, wildlife and beck that bubbles past. The open front of the lodge joins with a “floating” sun deck overhanging the beck. Savour a chilled drink or two from the attending drinks chiller in the cabin then kick back and unwind in the spa or on a lounger placed on the sun deck. We hope that you are tempted to stay and we’d love to welcome you to a relaxing and memorable cottage holiday. Although our Lake District Cottages are Dog Friendly our hot tub Jacuzzi is just for humans!